Greece may need a third bailout but would not accept new austerity measures, the Greek finance minister has said. 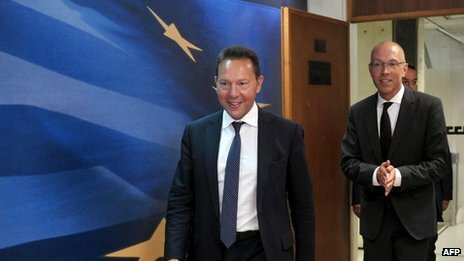 Yannis Stournaras said: "If there is need for further support to Greece, it will be in the order of about 10bn euros (�8.6bn; $13.4bn), or much smaller than the previous programmes." Greece has already received two bailouts totalling about 240bn euros. Meanwhile, Angela Merkel has warned about writing down any more Greek debt. Germany's chancellor said a so-called haircut of Greek debt would be bad for the stability of the eurozone, which has seen a return in investor confidence after years of worrying about the future of the single currency following bailouts of several nations - most recently, Cyprus. "I am expressly warning against a haircut," Mrs Merkel said. "It could trigger a domino effect of uncertainty with the result that the readiness of private investors to invest in the eurozone again falls to nothing." Her comments come after Germany's finance minister, Wolfgang Schaeuble, said - for the first time - earlier this month that Greece will need another bailout to plug a forthcoming funding gap. The issue of bailouts is a sensitive one in Germany, where Mrs Merkel faces elections for a third term on 22 September. Many Germans feel they have already contributed enough to European bailouts. The International Monetary Fund (IMF) last month estimated Greece would need around 11bn euros in 2014-15.